We need to develop a civic sense and make it a habit to keep our surroundings clean all the time- Chowna Mein, Dy CM, Arunachal Pradesh. Deputy Chief Minister, Chowna Mein launched the fortnight long movement of ‘Swachhata Hi Seva’ (Sanitation is Service) for the Capital City at Gandhi Park, Niti Vihar here this morning. Addressing the gathering on the occasion, he lauded the Prime Minister Narendra Modi for bringing the sanitation in to a movement with the launching of Swachh Bharat Abhiyan on 15th August in the year 2014 which became a national movement and largely accepted by the masses across the nook & corner of the country. He said that the effect of the Swachh Bharat Abhiyan is visible in the State too as the Capital City which was ranked amongst the third dirtiest city in the year 2016 has significantly improved its position and placed in the 216th cleanest city of India by the Swachh Survekshan (survey) 2017. He expressed hope that with the current motion and participation in the Swachh Abhiyan by the people, the capital city will further improve its position in the cleanliness chart. Mein further said that we should not stop the cleanliness drive with the end of Swachhata Hi Seva Movement but we need to develop a civic sense and make it a habit to keep our surroundings clean all the time. Echoing the voice of PM Narendra Modi, he said that to keep the nation clean will be our greatest tribute to the Father of Nation. On the occasion, he offered floral tributes to the statue of Mahatma Gandhi at Gandhi Park, Niti Vihar and also administered Swachh Abhiyan Pledge to the people. He led the cleanliness drive in the vicinity which was joint by the Capital Complex MLA, Techi Kaso, DC Capital Prince Dhawan and officers & officials from Urban Development. 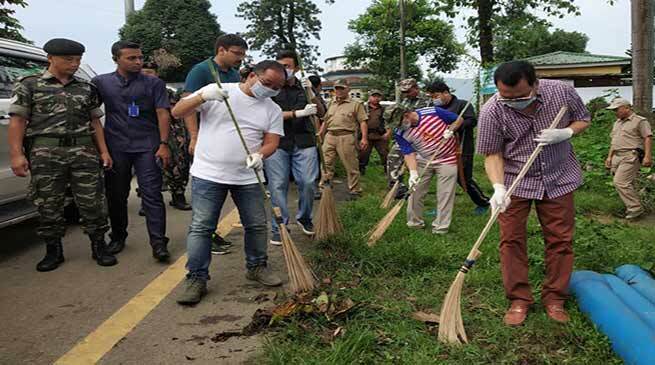 Later, Mein also attended the Statewide launching of Swacchata Hi Seva Movement by the Governor of Arunachal Pradesh, Brigadier (Dr) B D Mishra at Mani Govt Secondary School near Doimukh.